This paper provides new evidence on the labor market effects of conflict-induced restrictions to mobility. To identify the effects, the analysis exploits the fact that the placement of physical barriers by Israel was exogenous to local labor market conditions and uses a measure of conflict intensity to control for the likely spurious correlation between local unrest, labor market conditions, and the placement of barriers. The study finds that these barriers to mobility have a significant negative effect on employment, wages, and days worked per month. The barriers had a positive impact on the number of hours per working day. These effects are driven mainly by checkpoints while other barriers, such as roadblocks and earth mounds, have a much more limited impact. Only a tiny portion of the effects is due to direct restrictions on workers’ mobility, suggesting that these restrictions affect the labor market mainly by depressing firms’ production and labor demand. The efficient mobility of goods and labor is one of the most important features of a functioning economy. 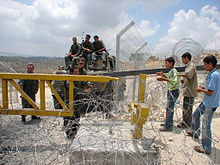 Restrictions to the mobility of goods and labor across Palestinian borders have been put in place by the Government of Israel especially since the outbreak of the first Palestinian uprising (first Intifada) in 1987. Therefore this channel would unambiguously predict that the barriers should reduce the probability of being employed in all locations.